Advanced Manufacturing Office to improve the energy efficiency of the U.S. Mechanical Insulation Education & Awareness Campaign (MIC). calculator for equipment, vertical flat surfaces, also was developed. and Spherical Systems by Use of Computer Programs. return, and annual CO2 emissions. for each input variable. Sample inputs appear in a box, after each instruction. linear foot before completing line 1 and line 7, the cost multiplier. materials are based on ASTM material specification values. down by simply modifying the multiplier. Enter 1.10 if your cost is 10% higher. Enter .80 if your cost is 20% lower. variances exist is the reason the multiplier approach was selected. years. You can enter any number of years. five types of fuel: Natural Gas, Oil, Propane, Coal, or Electricity. simply entering your actual cost, if known, or accepting the default cost. 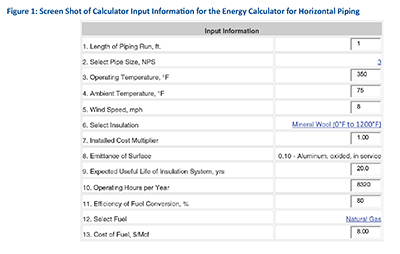 input variables is shown in Figure 2 on page 27.
details about the insulation system (material and jacketing). these calculators, and some are available in sizes and thicknesses not listed. ASTM specification and the material type and/or grade used in the calculator. the drop-down box, you can select any pipe size from 0.5″ to 24″. is 40°F, but other values may be entered. temperature, in Fahrenheit, for the area in question. reasonably higher-than-average or worst-case value. doubt, use 0 mph, which represents the worst-case conditions. on ASTM material specification values. 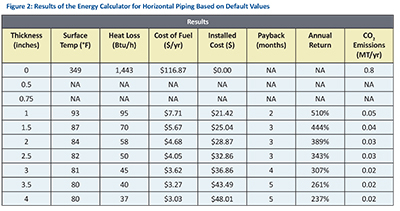 calculator for horizontal piping, a definition of emittance is often requested. all input variables is shown in Figure 4.